A tenant is a person who occupies land or property by paying rent. The tenancy agreement is the binding document for the tenant as well as the owner. This agreement has the rights, duties and other points applicable to both the tenant and the owner. The agreement may have points related to some specific tenancy rights. Apart from the right to live in the property, the owner may give the tenant a right to sell his tenancy right to a third party. Here, tenancy right would mean the right to live in/ use this property. The tenant pays some amount to get this right and become a part owner of the house/property alone and not the land. This is also known as ‘Pagdi System’ in some parts of India. In the simplest form, say Mr. A resides in a house taken on rent from Mr. X. Mr. A is the tenant, Mr. X is the owner of the property. The Tenancy agreement allows Mr. A to sell his right to stay in Mr. X’s house to any other person. This privilege available to Mr. A is called tenancy right. He had pad Rs.1,00.000 to get this right. This Rs. 1,00,000 is known as the tenancy premium. 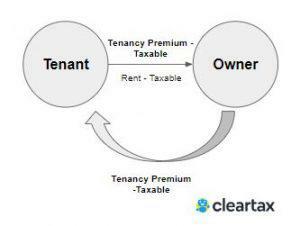 Tenancy premium is a payment for a right. It could even mean some amount paid by the owner of the property to the tenant, to leave the property before the time it was agreed between them. X is the owner of a property. Y takes this property from X on rent. Y pays Rs. 10,000 monthly to A. Before the end of the agreement, X pays Rs. 1,00,000 to Y, so that Y vacants the property. This Rs. 1,00,000 is also called Tenancy premium. Here X is paying Y so that Y surrenders his right to stay in the property. Before GST, under the service tax law, transfer of tenancy rights was considered to be a declared service and the tenancy premium was the consideration for this service and was taxable. As per the definition of Supply in the act, Supply of services also includes lease, tenancy, easement, license to occupy the land, etc. Thus it can be said that transfer of tenancy rights is supply under GST. Will GST be attracted on tenancy premium when stamp duty and registration charges are paid on this premium arising as a result of the transfer of tenancy rights? With the recent circular the vacuum around these questions is cleared. We need to agree that, just because a transaction involves documents to be created which may require some kind of registration and payment of registration fee and stamp duty, we cannot say that this loses its identity of being a supply. Stamp duty and registration charges are not the only deciding factors to decide if a transaction is to be treated as sale of land or building. In all cases since the transfer of Tenancy Rights for Tenancy premium is considered as supply it will be taxable under GST. However, renting of residential property for use as a residence is exempt. So it can be said that any rights are transferred for residential purposes, it won’t attract GST. GST will be applicable even in cases where stamp duty and registration fees are paid. 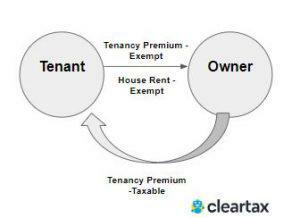 The tenancy premium given to the tenant (outgoing tenant) will be also taxable under GST. To understand better about GST and related compliance, click here.